This ferociously fun feline print will delight your pride. When it comes to statement-making art, the competition is about to get fierce. Brian, as he's affectionately named, was created by Jennifer Mercede, who brought her leonine subject to life using ballpoint pen, watercolor crayon, colored pencil, and acrylic paint on wood. 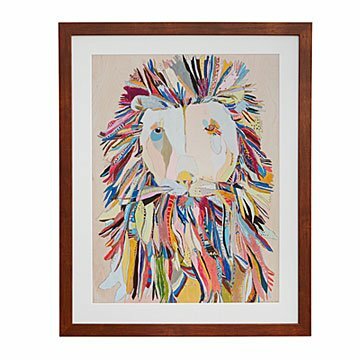 His kindly face is framed by an untamed mane roaring with wild colors and patterns. A traditional symbol of courage, authority, and wisdom, this ferociously fun feline will delight your pride, whether he reigns over the kids' playroom or greets guests in your entryway. Printed and framed in Portland, Oregon. Portland, Oregon artist Jennifer Mercede loves scribbling, doodling, being silly, and being expressive with paint, markers, crayons, and whatever is at hand and suits her mood. Her goal is primarily to get into the zone where she can forget all else and surrender to the joy of creating. She is spontaneous in her creation and enjoys thinking on a whim in a variety of expressions, including art, music, and writing. Her love of color is evident in her bright and sophisticated palettes, producing a unique ‘street-art-meets-fine-art-meets-toddler-art’ style.